Long ago in a small town in Pennsylvania a toddler rode on her bouncy horse and proudly told everyone she was going to be a "horse doctor" when she grew up. That little girl never lost sight of that goal. 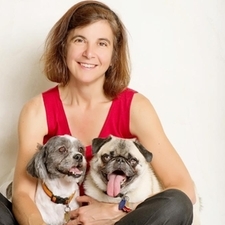 She earned her undergraduate degree and then her doctor of veterinary medicine in 1992 from Cornell University and is Dr. Leah Greenberger. Her path took her to Maryland and then Virginia where she operated a successful small animal practice in a rural area near Norfolk. Along the way she rescued, fostered, and adopted a legion of dogs and cats and developed her love of birds, reptiles, and other exotic animals. She never lost her love for horses and riding. When she moved to Massachusetts in 1999, she practiced emergency and critical care veterinary medicine throughout the area. These specialties developed her skills as a diagnostician and exposed her to a wide variety of medical experiences. 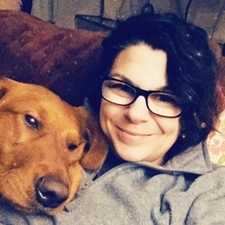 Dr. Leah brings all of her background, love of animals, and experience to Belchertown Veterinary Hospital. She still retains her interest in emergency medicine and her longtime love of exotic animal medicine. 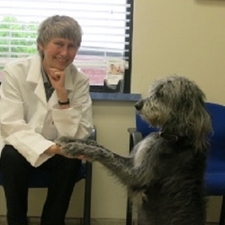 Dr. Susan Cleary received her DVM from Cornell University, completed a veterinary internship at the University of Illinois, and served as a Peace Corps volunteer in Morocco. 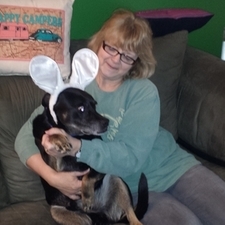 She has many years of experience caring for pets and has a special fondness for house rabbits and geriatric cats. She lives with her son, Biruk (and is still missing her beloved dog, Tosca).She now has a poodle mix named Alice, a cat named Summer, two ferrets named Conrad and Saxon and a Russian Turtoise. In her spare time, she enjoys exploring ponds and marshes in a small wooden boat she carries on top of her car. Kirstin was born and raised in Germany. During a visit to Tennessee in 1992, she met her husband-to-be, a U.S. Army soldier stationed at Ft. Campbell, KY. Together, they have two sons. Kirstin spent 18 years following her husband wherever the call of duty sent him. After many years of moving all over the world, her family has settled down for good. In November of 2012, Kirstin joined our team. She has an especially soft spot for puppies! In her free time, Kirstin enjoys spending time with her family, fishing, motorcycle rides and her own furry babies, especially German Shepherds.. Like everyone here, she is looking forward to the opportunity to meet you and your pets and hopes to help make your visits great! Graduate of Animal Behavior College as certified Veterinary Assistant. 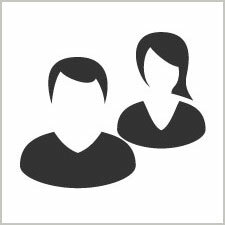 Susan joined our team in February of 2016. She previously worked in the human medical field but her love of animals drew her to work in the veterinary field. She is a Native Vermonter who now lives in Belchertown with her husband, two dogs, three cats, a chinchilla and chickens too numerous to count. Susan's favorite animals are the down-trodden ones no one else wants. Her dream is to win the lottery and open a huge rescue! Besides her animals Susan loves to garden and restore furniture into pieces of art. Faith attended Holyoke Community College and UMass Amherst, graduating with a degree in Biology. She minored in Criminal Justice and was certified as a veterinary technician in Connecticut. She served in the Army as an MP for 10 years. When asked about her current profession she states, "I love animal medicine. It is so fulfilling to be a part of the healing process and a part of the care. If I went back to school I would definitely pursue a career in animal and human communication. Each animal I encounter is so different and unique in the way they communicate. A touch from a purring cat or the depth of the stare of an old dog can warm my soul. Trust can be difficult sometimes, but once it is gained, unconditional love is certain." She has a cat, two dogs, and is a Yankees fan. Attended HCC and UMASS Amherst graduating with a degree in Biology. Shanelle joined our team in September of 2017. As a child, she always brought home stray animals, wanting to care for them. 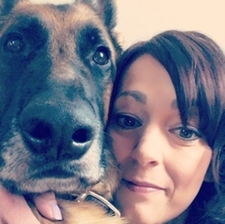 For as long as she can remember, she has always wanted to work in the veterinary field. Shanelle now lives in Brimfield with her horse, Cooper, 3 cats(Mittens, Simba and Emma) and the love of her life, her Australian Shepherd Payton. In her spare time she loves to ride her horse, hike with her dog and fly fish with her fiance Tyler. Like the rest of our team, she strives to make every pet feel at ease and comfortable at each visit. Will came to our team in January of 2018 and has been in the Veterinary field for over 10 years. Despite countless people suggesting his voice belongs on the radio, he appreciates the time interacting with animals brings. 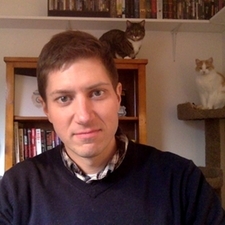 Will has three cats, Chuck, Owen (both pictured) and Snickers. He graduated from Elms College in Chicopee with a Degree in History and a recent graduate of the Reserve Police Academy in Springfield. During the month of October, Will organized the ?Feed a Pet, Help a Vet? Program, which saw us take in Pet Food donations for the Pioneer Valley USO. Most recently, he has been helping raise funds for the Belchertown K9 unit. His spare time is filled with a variety of interests too expansive to list. Will takes pride in providing a comfortable experience for all the animals that we see, especially cats. Perhaps our feline patients like him because he is an August Leo?. 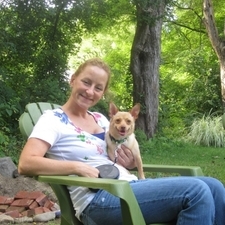 Jen has worked in the veterinary field for almost 20 years. She initally started working at reception but quickly moved on to assisting. She quickly aquired new skills and has since worked in a variety of settings such as small animal medicine, large animal medicine, shelters and spay/ neuter clinics. She lives in Monson on her hobby farm with her husband, her son, 2 cats,3 dogs, a horse and a pony. Jen stays busy around her little farm. She also enjoys family time,kayaking, hiking with her Golden Retriever and training her horse in dressage. 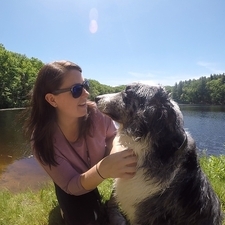 She has a soft spot for Golden Retrievers and naughty cats- during her first year living in Monson, she successfully trapped, neutered and released 29 of them!